This raw image was taken on April 7, 2010 by NASA's Cassini spacecraft. The camera was pointing at Saturn. 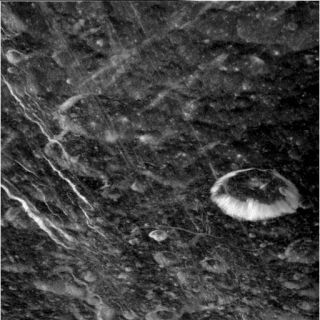 But, by appropriate orientation of the spacecraft, the cameras were able to capture Dione in the sights. New images of the fractured terrain of Saturn'slittle-visited moon Dione have been snapped by NASA's Cassini spacecraft as theprobe performed a double flyby of Dione as well as Titan. The Titan flyby took place April 5, and the Dione flyby occurredApril 7 in the UTC time zone (April 6 Pacific time). The flybys were madewithout any maneuver in between the moons thanks to a fortuitous alignment ofthe two bodies. During the Titan pass, an unexpected autonomous resetoccurred and Cassini obtained fewer images of Titanthan expected. But the cameras were reset before reaching the icy moon Dione,which was the primary target on this double flyby. Cassini has visited Dioneonly once before, in October 2005. Cassini swooped down to within about 300 miles (500kilometers) of Dione's surface. The new raw images of Dione show the moon's fracturedterrain and craters big and small. Scientists are poring over data from Dione to discernwhether the moon could be a source of charged particles to the environmentaround Saturn and material to one of its rings. They are also trying tounderstand the history of dark material found on Dione. Cassini had made three previous double flybys and anothertwo are planned in the years ahead. The mission is nearing the end of its firstextension, known as the Equinox Mission. It will begin its second missionextension, known as the Solstice Mission, in October 2010. One of the lastplanned activities of Cassini at the end of the Solstice Mission is to fly intoan orbit between Saturn and its rings in an effort to determine how much massis in the rings, which will help scientists determinethe rings' age.